Everybody knows weight management can be hard. Thankfully, Ultimate ACV can be a great supplement to a healthy diet and exercise regimen, to help you achieve your weight management goals. Using the power of apple cider vinegar, Ultimate ACV gives your body the boost it needs to stay strong, fit and healthy. Ultimate ACV offers a huge range of positive effects on your body and well-being, including support for weight management, digestive health, and overall health and wellness. Are you always hungry? Do you have trouble resisting the urge to snack? Not to worry! Ultimate ACV can help with decreasing your appetite, to make you feel full - faster and longer. This helps prevent overeating or mindless eating. That, in turn, reduces calorie intake. The best part of Ultimate ACV is that it makes getting a solid amount of apple cider vinegar in your diet much easier than having to drink it in its liquid form. Many people find apple cider vinegar to have a very strong smell and taste, and it can be hard to directly consume. 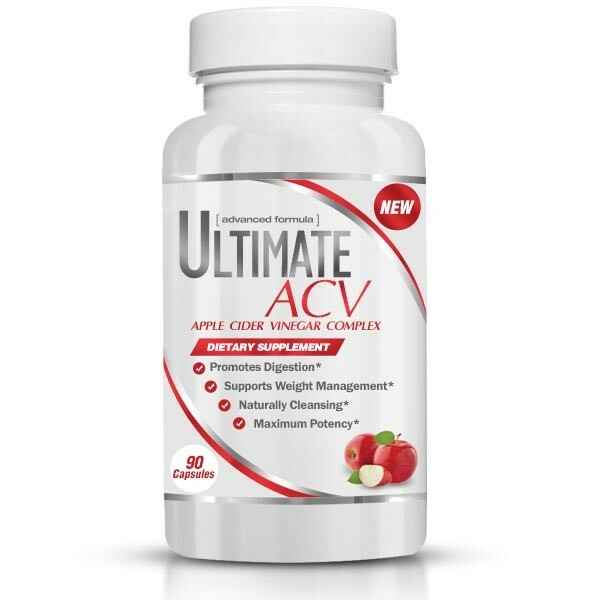 Ultimate ACV lets you reap all of apple cider vinegar's health-boosting benefits in a convenient, easy-to-swallow capsule. Take one (1) capsule, up to three times daily for optimal results. Take with food, or as directed by a medical or healthcare professional. Apple cider vinegar is made from fermented apple cider. Because it is rich in probiotics - 'good' bacteria - apple cider vinegar may help support a healthy, balanced gut and digestive system. Probiotics are believed to strengthen your immune system to keep you strong and healthy. Apple cider vinegar contains acetic acid, which is said to help support weight-management. It may reduce appetite and make you feel fuller, faster and longer. This helps curb cravings and prevent overeating. Apple cider vinegar may also have a beneficial effect on skin. Some use it to help keep their skin clear and healthy, as it may prevent breakouts. Helping to turn food into fuel, the B vitamins help to regulate your energy levels. Vitamin B 6 may support heart health and brain function. It may also help strengthen the immune system to keep you in top shape. The body must have a solid supply of iodine to function normally. People can become deficient in this essential mineral, which may result in a weakening of the immune system and metabolism. Many people have started using iodine recently in conjunction with their weight management programs, to help promote a healthy metabolism. This nutrient-rich algae contains a host of essential amino acids that keep the body healthy. Spirulina is also a great source of protein. It has many antioxidants, vitamins, and minerals including vitamin B and E, zinc, iron, beta carotene, and fatty acids. Bromelain is derived from the pineapple fruit. It is widely praised for the wide variety of health benefits it can provide. Bromelain is even sometimes used by doctors to treat different health conditions. It is believed to reduce inflammation, to keep the body balanced and healthy. Bromelain may speed up healing time as well as alleviate stomach upset. Complete List of Ingredients: Vitamin B-6 (pyridoxine HCl), Iodine (Kelp), Potassium (chloride), Apple Cider Vinegar (powder), Spirulina, Lecithin (from soybeans), Kelp (thallus), Apple Pectin (fruit), Bromelain (2500 GDU).